Isn't Dr. Freud the most handsome guy you've ever seen? Coming all the way from Knoxville, TN to seek out his forever home here in Chicago, Dr. Freud is an active guy with a huge heart. Adopters should have a strong exercise plan to allow a productive expense of energy, while making sure he has plenty of time for cuddles and kisses. Though he is one big love bug, Dr. Freud also loves to explore and will require some initial monitoring to make sure he doesn't find himself any mischief. Initially weary of other dogs, Dr. Freud might be better suited in a single dog home-though his hesitation has the potential to subside. 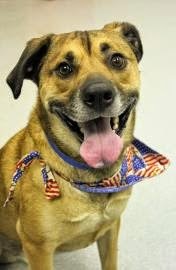 If you're looking for an active yet loving companion, Dr. Freud is definitely the dude for you!